It’s the last afternoon and boiling hot. So Matt Napper suggested that we go back to the same general area where I killed my hog in '05. My son Matthew was conflicted. He wanted to come with me, but hanging with Cheryl was fun as well. When he came out of the cabin dressed in his Realtree gear I knew which activity he had chosen. We climbed into Cheryl’s mule, which is an ATV/buggy sort of thing and headed down to the area where Matt and I would set up. When we reached it I started checking the wind and looking for a good ambush location. 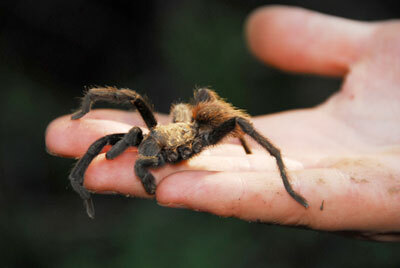 Matt Napper was checking on some things too and asked me a strange question: Pat, ever seen a tarantula before? I looked down and there it was. I had seen them in glass tanks and photos but never in the wild. It was missing a leg, so we nicknamed it Heather Mills McCartney. My kids were going wild, especially Matt. In just two days he had found countless scorpions, a copperhead and a tarantula. It just doesn’t get any better than that. I held out my hand and let the tarantula climb into my palm. It was freaky, and I sure hoped Heather was in a good mood. The spider got my son Matt thinking that it may be more fun to look for more creatures. So off he went with Cheryl and Pat Jr. I can’t say I blame him for better-dealing his old man to search for poisonous creatures. I set up the video camera with a fresh battery and a blank 63 minute HD card then hit record. 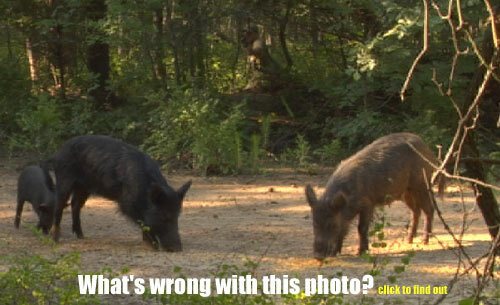 If you recall from my last hunt here at Shiloh, I was able to film a unique, reverse-angle shot at my hog which is difficult to accomplish. Because there are so many hogs at Shiloh, this is one of the few places I could pull this off. I got into position and waited. My wait didn’t take very long. As soon as Matt drove away, hogs began to appear. I had two hogs in range immediately. What they didn’t realize was that Matt had turned around and was coming back. When he drove by, he scared the hogs into the trees and one of them nearly knocked me over! The scene was quiet again as I began my wait. The other hogs did not go very far and began to trickle back in after about 10 minutes. There was a really big boar in this area. He had tremendous teeth. But since I had no intention of getting him mounted I told Matt I’d pass on him if he appeared. I just wanted a meat hog and he could save the trophy boar for one of his future hunters. The first hog that came in was exactly what I was looking for. A medium sized sow that would be good on the grill. It stopped at my strategically placed corn pile and I drew my new Bowtech Guardian. If you count on the video, I am at full draw for 70 seconds. Finally, it moved into a good angle and I released. I was purposefully aiming low at the elbow and that's where I hit it in the chest. But in hindsight I misjudged the angle and shot too far forward. The arrow hit the leg bone which caused it to take a radical angle out the far side of his neck. The Muzzy MX-4 had blown an almost grotesque hole in the bottom of the front chest. One of the blades had bent around the elbow which allowed the arrow to continue forward. The bloodtrail was incredible and my hog laid down in 80 yards. But while he was down, it was still breathing when we approached it. I put a finishing shot into the hog and it was over. The entire family is tagged out. We shot at four hogs and we recovered all four. My kids did better than their parents and they keep reminding us of that. Julie and I are extremely proud of them and the best part? They are proud of themselves for doing it right. Pat took his hog with a Bowtech Guardian, Easton Full Metal Jacket Shafts and a Muzzy MX-4 head. For Camo he used Realtree Max-1. This was one small memory from a hunt chock full of them. It’s these memories that form lasting impressions and I can’t imagine a better hunt than with Matt and Cheryl at Shiloh. This hunt exceeded all of our expectations and we can't wait to come back! 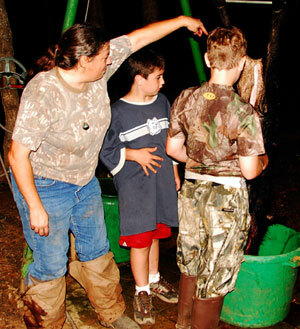 Setting up a childs' first hunt is stressful for a parent. Let's face it, our kids may enjoy coming along with us on our hunts, but they want to hunt too. So getting them started in bowhunting needs to be a priority for all of us before they become distracted with other things in their life. I started thinking about my kids' first hunt long before they were ready. And I had made up my mind that a hog hunt provided the ideal setting. The reasons are simple: Hogs can be hunted all year long, you have a good chance at setting up for a close shot, you can use bait (which helps keep the animals anchored long enough for the shot) and they are still plenty challenging. Your kids' experience the need for basic woodsmanship skills of concealment, working the wind, and staying quiet. 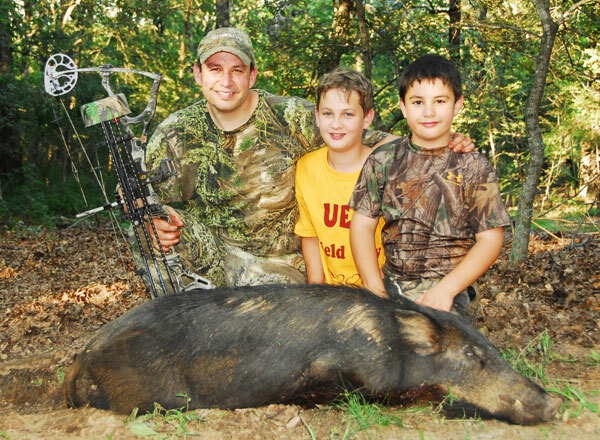 When it comes to shot placement, I think hogs are actually tougher to kill than whitetails so education and proficiency are vitally important and these are all great lessons for kids. Our choice for an outfitter was an easy one. Shiloh is one of our longest running sponsors - going back to 1998. In all those years I don't think I've ever heard a credible complaint from the many Bowsite.com visitors who've hunted with them. Matt and Cheryl were enthusiastic about hosting my kids' first bowhunts which certainly was important to Julie and I. But what really clinched it for me is that my kids absolutely fell in love with the place two years ago and couldn't wait to get back. If you have a child getting ready to start bowhunting, or if you've been itching to try a hog hunt of your own, you owe it to yourself to give Matt and Cheryl a call. Shiloh has lots of hogs, lots of stand locations, affordable prices, a nice camp setup and everything you need to kill a hog. You can't go wrong with them.